Founded in 2012, SAA Guide Service is Asheville’s Premier Fly Fishing Guide Service and Asheville’s Original Bass Fishing Outfitter. Our fishing guides specialize in smallmouth bass, musky, rainbow trout, brown trout, brook trout, and wild trout in WNC’s river systems. We are a licensed and insured fishing guide outfitter, and all of our guides are CPR and First Aid certified. Why Southern Appalachian Anglers Guide Service? Southern Appalachian Anglers Guide Service is founded upon providing trips on clean rivers that do not experience excessive fishing pressure. Avoiding crowded areas allows our clients to truly experience the serenity and beauty of the outdoors. Our expert fly fishing guides will ensure that everyone in the family has an exciting fishing experience in our Asheville mountains! Read more here! Southern Appalachian Anglers LLC provides a variety of different guide trips to meet the needs of all our clients. Trips offered include full-day and half-day fly fishing, trout fishing, bass fishing, musky fishing, and more. SAA also offers backcountry guided fishing trips where your private guide will take you to wade one of our wild-water streams for wild trout. Backcountry wild water trips are some of the most sought after trips in Asheville and Western North Carolina, so don’t miss the opportunity to explore natural flowing rivers while wading for wild trout. This is an incredible and relaxing experience that offers our clients a full day in the beautiful mountains. Check out all of our guided fishing trips here! At Southern Appalachian Anglers we are dedicated to providing every client with the most successful fly fishing guide trip possible. As a professional and well-respected fly fishing guide service, we aim to to provide the greatest satisfaction for all of our clients. As we push our company to reach its full potential, we find it imperative to continuously evaluate our standards of excellence. Our professional guides provide frequent feedback, but we are most interested in our clients’ evaluations. We strive to commit to excellent standards, and we ensure that all of our guides are certified and hold extensive knowledge of the waters in Asheville, and Western North Carolina. To provide feedback about your guided fly fishing trip please email us at staff@southernappalachiananglers.com. SAA’s team of fishing guides will have your choice of fly fishing or spinning equipment – just let us know your preference when booking the trip. Techniques including fly fishing, spin-fishing, tight-line nymphing, finesse smallmouth fishing and others. Regardless of the technique used, our professional fishing guides in Asheville, North Carolina have three main goals: we want you to have an unforgettable day on the water, we want you to catch a fish of a lifetime, and we want to share our fishing expertise in an effort to teach you how to become a better angler while conserving WNC. We hope you leave your guided fishing experience equipped with new knowledge and techniques that help you catch more fish at home. View our history and knowledge of the waters we fish at our history page. All of our fishing professionals are licensed guides and have been helping clients learn the art of fly fishing for over 25 years. Our staff is also first aid certified and CPR approved by the American Heart Association. Owner and guide, Paul, is certified in holding a United States Coast Guard license to ensure safe and exciting fishing trips. To provide our clients with an optimal experience our guides are on the water daily and know which techniques work on the river. We consistently strive to provide you with a successful experience throughout your guided fishing trip. Our guide staff will take care of everything you need to have a memorable fishing trip. We offer state-of-the-art equipment, and full-day fishing trips include all fishing equipment, lunch, drinks, and adventure. 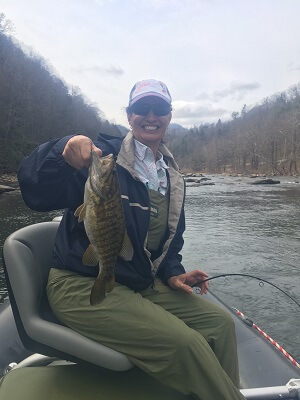 Come spend a day wading or floating the river with our friendly fishing guides while enjoying the magnificent Appalachian Mountains that surround Western North Carolina. 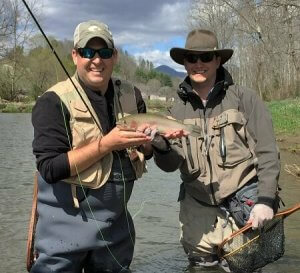 To learn more about our fly fishing guide service in Asheville and to view our rates and packages, visit our Guide Service page.